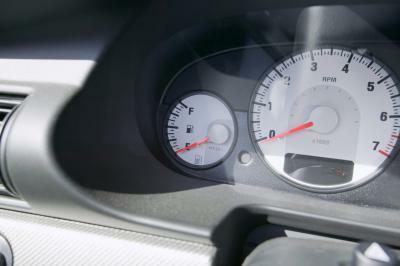 What Makes the Speedometer in a Car Fluctuate Sharply? A mechanical speedometer has a long flexible cable that connects it to the driveshaft of the car, which makes the wheels turn. As the end of the cable connected to the driveshaft rotates with the wheels, so does the end connected to the speedometer. As that side rotates, it turns a magnet in the back of the speedometer casing at the same speed the driveshaft is moving. The magnet rotates inside a hollow metal cup (called the speed cup) in the back of the speedmeter. 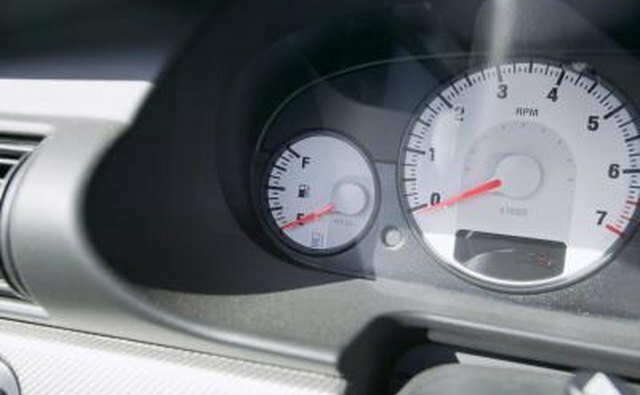 The magnet doesn't actually touch the cup as there is a buffer of air between them, but the cup is attached to the pointer in the speedometer dial. As the speed cup starts to spin around, it rotates the magnet at the same speed. The magnet creates an electromagnetic field inside the speed cup and produces an electric current. Since the current is running in a conductor and through a magnetic field, it creates motion. The speed cup is prevented from moving too much because of a hairspring that holds it in place. The greater the speed of the car, the greater the speed of the magnet and the more the speed cup tries to spin past the hairspring in response. As the speed cup slowly rotates, the pointer moves up the dial on the speed gauge. When the car suddenly slows down, the magnet quickly slows as well. The speed cup stops rotating as much, and the hairspring moves it back towards its start position--meaning the pointer on the dial moves back towards zero. An electrical speedometer works on a similar principle as the mechanical one, but has a simpler design. The driveshaft has magnets attached directly to it, and as it rotates the wheels, the magnets sweep past stationary magnetic sensors located nearby. When the magnet passes by a sensor, a brief electric current is created. In modern cars, a circuit counts how many pulses it receives in a given time interval and converts this calculation into speed. Some electric speedometers use a dial and pointer instead of an LCD display by using an electric motor controlled by the same circuit that counts the electric pulses and calculates speed. The speedometer can fluctuate rapidly under normal driving conditions when the car's speed changes abruptly, but sometimes the needle can start swinging around the dial without any fluctuation in speed. If the hairspring comes loose or breaks, it can't hold the speed cup in place, and the result is a fluctuation in the dial. In electrical speedometers, if the circuit that counts the magnetic pulses fails, it can cause the speedometer read-out to vary from the actual speed and to shoot upward or downward without notice. If a speed sensor in the automatic transmission starts to malfunction, it can affect the speedometer and cause fluctuations. In these instances, either the speedometer or the sensor needs replacement. What Is a Vehicle Speed Sensor? What Is a Clock Spring in a Car? What Is Overdrive in a Car Transmission?